Here is an introductory paragraph to a paper by the Federal Bureau of Entomology, released in December of 1948, as DDT, the latest wonder chemical, came into wider and wider use, “safer than arsenic” they assured us. The chart below has recently been updated by Dr. Bonmatin of France. Based on new data on LD50s, deltamethrin and clothianidin have moved to the head of the parade at 10,800 times the toxicity of DDT. The neonicotinoids are being applied to hundreds of millions of acres every year. The argument hasn’t changed in 66 years, but the difference today is that the environment is being poisoned at almost incomprehensible levels with some of the most toxic chemicals ever created. In its peak year,1959, 80 million pounds of DDT were used in the U.S. 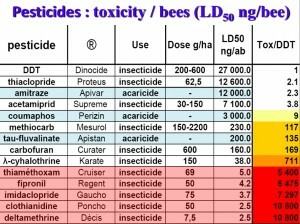 The most recent figure for the neonicotinoids are for 2009, 3.4 million pounds, which have the toxic equivalent of 17.5 billion pounds of DDT. using the most conservative estimate. When more accurate figure are available it may reach as high as 30 billion pounds of toxic equivalence.